At the the High Court in Edinburgh, he was given a life sentence with a minimum jail term of 20 years before he can be considered for parole. The 27-year-old had admitted murdering his brother Cameron, who was 23, and attempting to murder Cameron's 25-year-old girlfriend Rebecca Williams. 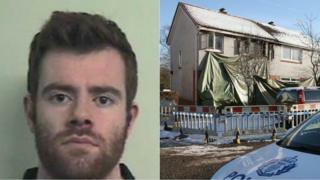 The conviction followed a fire at the Logans' family home in Milngavie. The incident took place in the early hours of New Year's Day. Blair Logan said he doused his sibling in petrol and set him alight but did not mean to kill him. The High Court was told that the brothers had a "hostile" relationship and had not spoken to each other since 2013. In a letter read to the court, his parents said they found it "extremely difficult to reconcile the Blair that they know with the Blair that caused Cameron's death". Both parents were in the courtroom in Edinburgh, along with Ms Williams and her family, as the sentence was passed by Lady Scott. She said Cameron was a "happy and much-loved young man" who had died a "horrible death" and that Logan "acted with wicked recklessness".